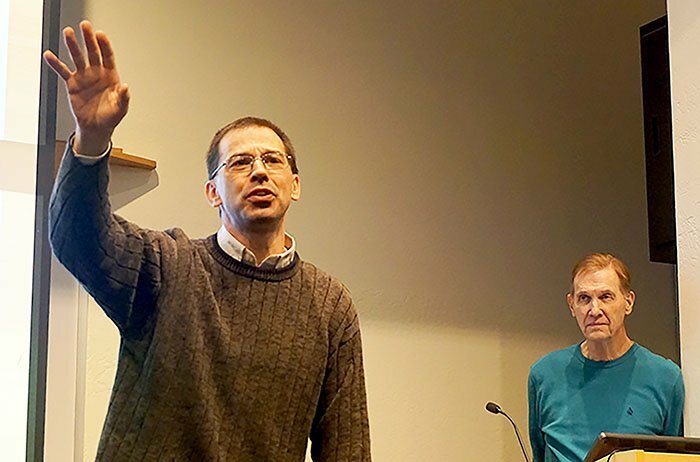 Dr. Wayne Schmidt, faculty chair for the College of Doctoral Studies, and Michael Kary, an instructor in the College of Fine Arts and Production, discussed the ways love is a discipline, a command and a gift when they presented at the latest “Lunch and Learn” speaker series event Friday at Howerton Hall. “Christian Love” was an exploration of secular and biblical interpretations of love and the transcendence of love beyond basic human instincts or shallow pursuits. The discussion was the fourth installment of the theme, “Things That Really Matter,” in the Integration of Faith, Learning and Work (IFLW) program for Grand Canyon University faculty. They said “love” is a choice we all make, whether it’s food, a sports team or family and friends. But it’s also a commandment from God and taught by example through Jesus. Love’s effect on both our own individual being and in any interactions with others sounds intuitive, but it can manifest itself in so many ways that might not seem obvious. Schmidt spoke of love in the context of “humility, compassion and forgiveness,” the latter of which was an eye-opening concept College of Theology Dean Dr. Jason Hiles later used to explain some less obvious and demanding ways we should love each other – namely, “Loving our Enemies” or those who have done us some harm. Hiles referenced Luke 6:27-36 along with the lives of Martin Luther King Jr. and Ghandi, three powerful examples of people who attempted to love and engage with everyone, even in the face of violence, death or destruction. Loving enemies and forgiving those actions is requisite to experiencing true love, no matter whether it’s reciprocated by people who may or may not be likable. Loving everyone and doing so without expecting any “reward” in return – Hiles noted that “sinners also have those whom they love” – is true kindness and compassion. “Loving like Jesus did is possible because in part because we are disciples of God and Jesus,” Hiles said. Doing so leads to unconditional love for each other and a truly beneficial existence.